"Uniform: Scrub Dress - 1" by Normadeane Armstrong Ph.D, A.N.P. 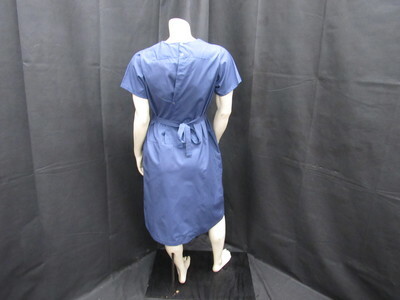 This is a short sleeve blue scrub dress made from a 50% polyester 50% cotton blend fabric. It was produced by Sunbelt Textiles which is part of Southeastern Hospital Supply Corps. and is made in the U.S.A. The scrub dress buttons in the back and ties at waist in the back as well. This is the size listed on the inside tag.